If you received a negative Google review and are wondering, now what do I do? This four step guide will outline what to do and what review elements actually matter. We will provide step by step instructions on exactly how to combat negative Google reviews through identifying the types you may encounter, how to respond and take action for removal. Negative reviews don’t have to be scary, in fact studies show that consumers are actually more likely to trust a business with a rating less than perfect over a business that has all 5 stars, they find it more authentic. Don’t believe us? Look for yourself at the below review examples. Which one seems more reliable? The below mattress business has all 5 stars, but a couple don’t have text and those that included details don’t seem very legitimate. 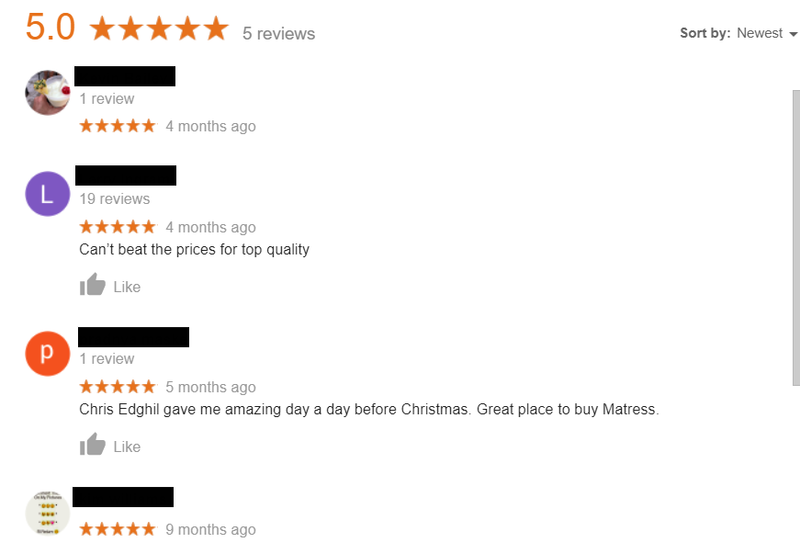 The below competing mattress business has a 4.4 which on the surface doesn’t sound better than a 5, but their reviews look much more believable. You can clearly see the company responded to one negative review to resolve the issue and the other one star review doesn’t exactly state a clear case that would really persuade someone not to choose this business. In this guide, we will explain the types of reviews you may receive, how to respond to each one, the importance of obtaining more positive reviews, and how to report reviews to Google for removal. Although these steps are focused on Google reviews, most of these guidelines can loosely apply to other platforms that accept reviews like Facebook, Yelp, Avvo and those alike. We simply wanted to get as specific as possible for this guide. 2. Reviews in violation of Google Guidelines. This truly will be up to Google to decide in the end, but we ask you to make your best judgement. Each one is then broken down into secondary categories. Genuine review with content: This is written by someone who had a true experience with your business whether they used your service/product or even just communicated with your receptionist on the phone. You may not have a record of this person, as Google does not require they provide their real name. However, if it reads like a review of an actual experience without violating any guidelines, this would be considered genuine by Google’s standards. No content review: This means the reviewer gave your business a star value (1-5 stars) but did not write any actual content along with it. Reviews without text is technically always in compliance because Google has no details to dispute either way. Unless you have extremely clear-cut evidence that can prove a conflict of interest or spam issue with the actual account the review was left from, it is very difficult for a no content review to violate any guidelines. Off-topic review: This is where the reviewer writes about irrelevant information to your business services/products such as personal commentary or rants. It is not an actual review about an experience with the business. It could even be a review left for the wrong business. 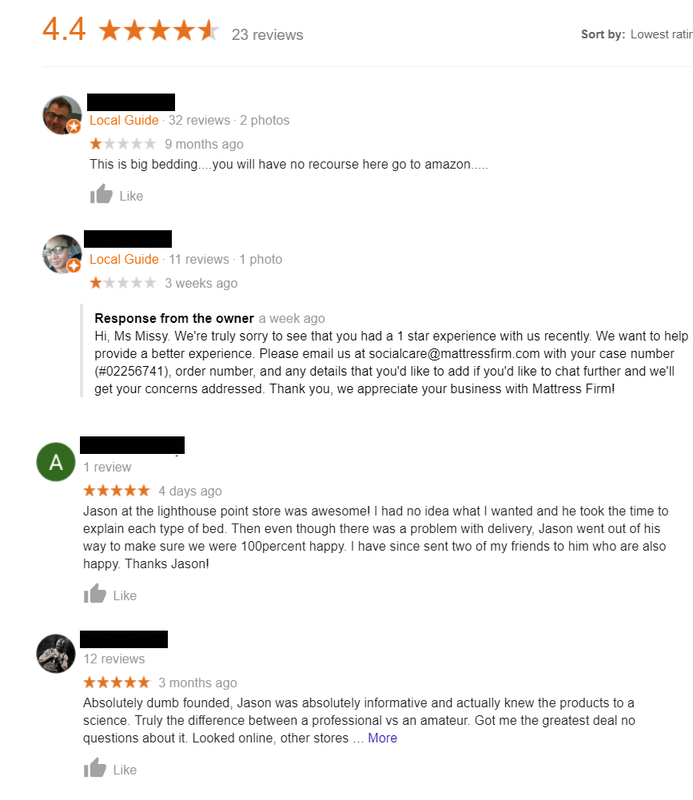 Spam review: This could be someone posting the same review from multiple accounts, posting duplicate reviews for the same business, or any similar tactic that tries to manipulate rankings. Spam is defined as unsolicited activity that is commercial in nature. Conflict of interest [Former or Current Employees]: This is a review from anyone who has worked at the business (including the owner), competitors, or anyone who may have a conflict of interest to manipulate the business rating. Other inappropriate content violating Google’s Guidelines: This includes harassment, sexually explicit content, hate speech, illegal content, or blatant impersonation. Note using a fake name is NOT considered impersonation. No matter if the review is fake, off-topic, or an actual client, responding is necessary to protect your reputation and show the business’ perspective. You may wish to hold off on responding to reviews that clearly violate the guidelines and will be removed anyway (obvious spam/employee review etc. ), but this would be more of a business decision. Any negative reviews that don’t get removed should always have a response, no matter the type, to guard your reputation. Be EXTREMELY careful on how you respond in regards to tone, context and details. What to say within your reply will vary greatly depending on what type of negative review you’re dealing with. Since you have already identified the type of review in step one, find the type below to see examples of acceptable responses. *Please note these responses are not meant to be used as templates. They are examples of the different ways you might respond to specific types of reviews. We recommend always tailoring your responses to address the specific issues brought up by the reviewer. Responses should NOT be cookie-cutter. Actual client who had a negative experience: We are so sorry to hear about your experience. We always believe in putting clients first and making sure their needs are met. We would love to speak with you directly to resolve this issue. Please call our office at 123-456-7890 and we can work out an immediate resolution. Individual the firm never had contact with: We thoroughly checked our records and have no evidence that Mr. Doe interacted with our firm. Mr. Doe was not one of our clients and has not used our legal services. Client feedback and satisfaction is extremely important to our firm and we strive to provide the highest level of service to every individual. Individual who interacted with your business, but did not use your services: We understand how frustrating legal matters can be and always strive to put our clients’ needs first. Unfortunately, we were unable to take on this case since it did not fall in within our expertise of personal injury. We hope the references we provided were helpful to you and we wish you the very best in resolving your legal matter. If you do happen to need help in the future with a personal injury case, we would be more than happy to provide a free consultation to discuss. No content review: We do not have any record of a Mr. Doe contacting us and do not have any clients by this name. We have never represented Mr. Doe and believe this to be a fraudulent review. If Mr. Doe did indeed use our legal services, we would be more than happy to discuss any possible issues by phone. We value every single one of our clients and believe in providing only the highest level of service for every personal injury matter. *Note if these are taken down by Google the response won’t matter too much in the long run, but it will be good for those to see while the review is still active. An employee: This review was left by a former employee and is not a true review of our legal services. We are committed to serving clients and the community with the highest level of service and take every client matter seriously. Incorrect Business (Off-topic): It appears this review was intended for ABC business and not our law firm. We are sorry to hear you had such a negative experience with ABC, we always believe in meeting our clients needs as much as possible. If you ever are in need of a personal injury lawyer we are more than happy to meet with you. If Google won’t remove the review, the only way to take power away from it is to bury it among more positive reviews. Current clients: You can ask them in person as you work with them to gradually build up positive ratings or use one of the methods below. Previous clients: Make sure you are confident they had a positive experience and reach out via e-mail to ask for their feedback and if they would be willing to share their experience with your firm. Create a page on your website that links out to various places they can review you like this one for example. Send an e-mail newsletter to multiple clients asking for feedback. We recommend MailChimp, but there are many other options available. Ask the client while they are physically in your office. Use a review service like getfivestars or gradeus. We have not personally used either of these services so we cannot recommend a specific one, but they may be worth looking into to see if it works for your business. There are multiple others on the market, but note they do require monthly or annual fees. *For e-mail templates, visit our review best practices page and scroll to the very bottom to download. 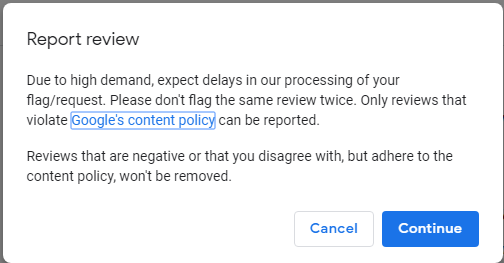 If the review is indeed violating one of Google’s guidelines, you can report it multiple ways. Click on the flag next to the review in Google maps like you see here. This can be done by multiple people, but is not as effective as escalating to support through social media methods listed below as you will not get any response back. Report the review through Twitter by sending a direct message to this handle. It normally takes anywhere from 3-10 days to get a response from support. Report the review through Facebook by sending a message to this page. This also takes around the same time to get a response like Twitter, but seems to have a bit slower turnaround time on average. Contact Google My Business Support by phone by filling out the form. Please note support calls on this line are handled by an outsourced call center. They are not always the most helpful and have a script they follow for all issues. Please be aware Google is very strict with what reviews they will remove. None of these report methods will work unless it is extremely obvious and clear that it is in violation of one of the guidelines. If you receive a denial through one of the methods above, it is highly likely you will receive another denial if reaching out a second time (no matter the method). It is more efficient to focus on positive reviews at this point instead of harping on the one negative. Reviewers can always go back to modify their Google review. Keep this in mind when drafting a response. If you attack the reviewer or say something that could further upset them, they could update the review to include a rebuttal. Always err on the side of caution and leave anything out that could possibly make the situation worse. Your business should be accumulating reviews all the time and should NOT wait to get reviews. Many businesses don’t act until they receive a negative review which then causes a huge reputation management issue. Instead, get ahead of these issues and build a wall of positive testimonials. Then, if you end up getting one bad review, it won’t cause much damage overall. Although it is important to reply to negative reviews, you should also respond to every positive review to thank the person for leaving feedback. This shows potential clients that you are appreciative and find value in connecting with every client, not just those who threaten your reputation. For more information about online business reviews, we recommend checking out the below related articles. Are you interested in learning more about legal marketing? Head on over to our SEO Guidelines & Best Practices page. Our guide will teach you the do’s and don’ts for law firm SEO along with what we include in our SEO plans.